This massive brick building featuring dramatic arched bays and decorated terra cotta cornice. Like the terra cotta spandrels in Maclure’s Temple building (525 Fort Street), some of the capitals of the piers support small faces. This was probably to show off the wares of the owner, Charles A. Vernon, who founded the B. C. Pottery Co. The ground floor housed the Waitt and Co. piano warehouse and Erskine, Wall & Co. grocers. 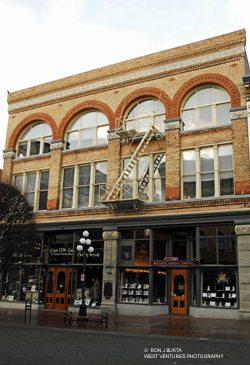 In 1907, the piano warehouse and grocers were still tenants. In 1947, the property was purchased by Pemberton Holmes Real Estate who had their offices there until the late twentieth century. When the real estate office moved to the suburbs in 1999, the building was restored and converted for retail use on the main floor with office above. In 2009, the lower storeys are occupied by Artinas Jewellers and Out of Ireland that retails Irish imports.